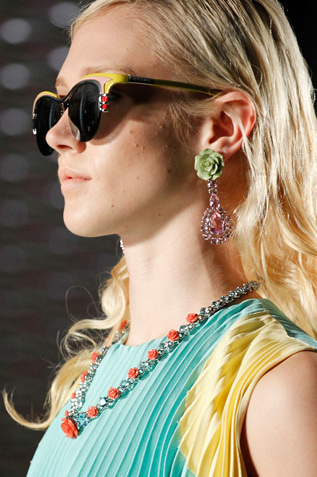 I am obsessed with Prada's Spring 2012 vintage-spirited rosette drop earrings and sparkling rhinestone and resin necklaces. In fact, I've thought many times about mining the local flea markets for lookalikes, but thankfully, now I don't have to, because I just discovered a motherlode of inspired options at Forever 21. Obviously, they're not as dramatic (or quirky or glittery) as Prada's baubles, but they'll do. For now. 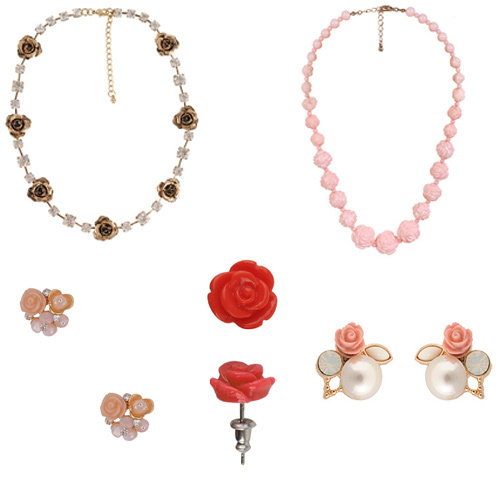 Pictured, clockwise: (1) Rhinestone roses necklace, $7; (2) Carved rosette necklace, $3; (3) Rose and pearl stud earrings, $3; (4) Red rose stud earrings, $1.50; (5) Rosette bouquet earrings, $5. P.S. I also snapped up this Tom Binns-like bib necklace, this pearl guy and this rope choker, while hauling the rosy batch above. Go, me!